Although Korean Air has a co-branded credit card, the sign-up bonus is probably not worth applying for many therefore it has been omitted from this analysis. It’s evident from the datapoint above that earning Delta miles is fairly easy as three high earning methods can let you amass a significant amount of miles in a short period of time. Despite all the devaluations that Delta has gone through recently and (got a lot of heat for it, rightfully!) taking away earning potential by making it purely revenue based, there are still some sweet spots in its new 2015 award chart. All the mileage rates shown above are for round-trip tickets and starting January 2015, Delta will finally start allowing one-way awards for half of the round-trip fare. Between the two award charts there really is not a “wow” factor, but looking closely at Delta’s partners is where the value (as little as it may be) lies. A round trip to Europe costs 60k miles in economy and 125k miles in business. Neither of these numbers jump out, however it’s still important to talk about this due to Delta’s partner Virgin Atlantic. 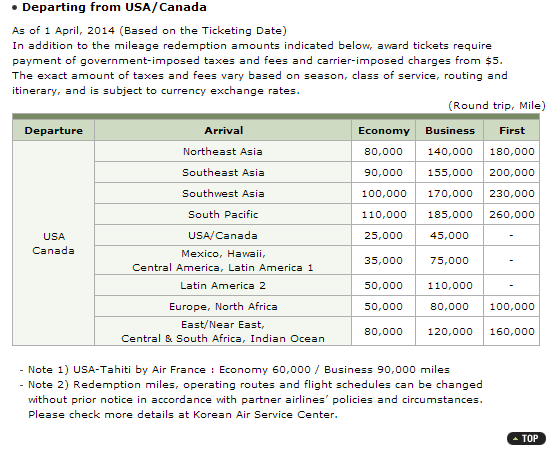 Award flights to London often have very high fuel surcharges, sometimes close to ~$900 for an economy award. However, Delta doesn’t charge fuel surcharges on Virgin flights! Delta’s partners allow for great choices to Asia and Oceania. 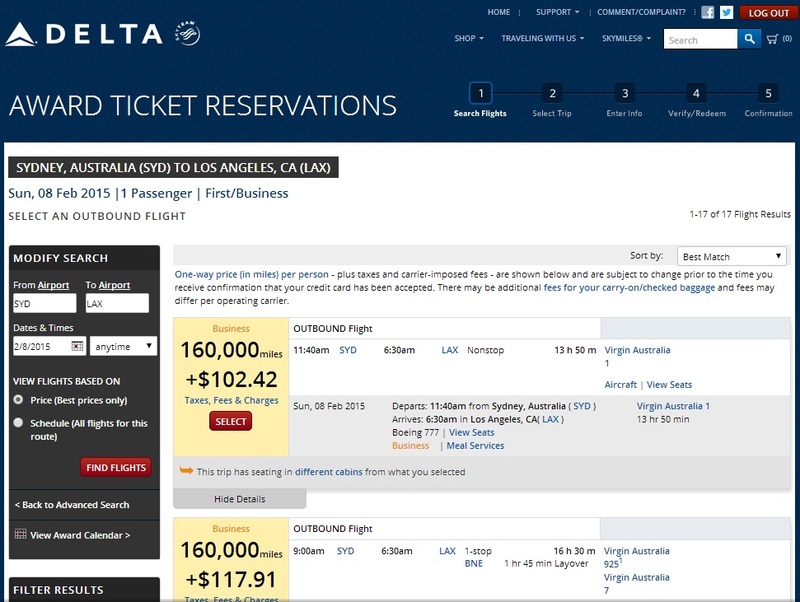 A sample use of Delta miles is going to Australia and New Zealand and roping in French Polynesia on the same award costing you 100k in economy or 160k in business. This is made possible because of Delta’s relaxed routing rules. Since Delta partners with Virgin Australia, Air Tahiti Nui and Air France, you can fly from Los Angeles to Tahiti, French Polynesia, stay for a few weeks then continue onto Auckland, New Zealand. This will have used up the one stopover that is allowed. As a member of the SkyTeam alliance, there are a plethora of partner airlines that fly to Asia such as China Southern Airlines, China Eastern Airlines, China Airlines, Garuda Indonesia and Korean Air. These airlines all have daily flights to their hubs and to some of the more popular destinations in Asia such as Bangkok, Bali, Seoul, etc. Using the relaxed routing rules, as shown above, you can really get innovative in the Asia region with the various popular destinations that you can visit on a Delta award redemption. Note that on flights to Asia, Delta does charge fuel surcharges on China Airlines, China Eastern Airlines, and China Southern Airlines. 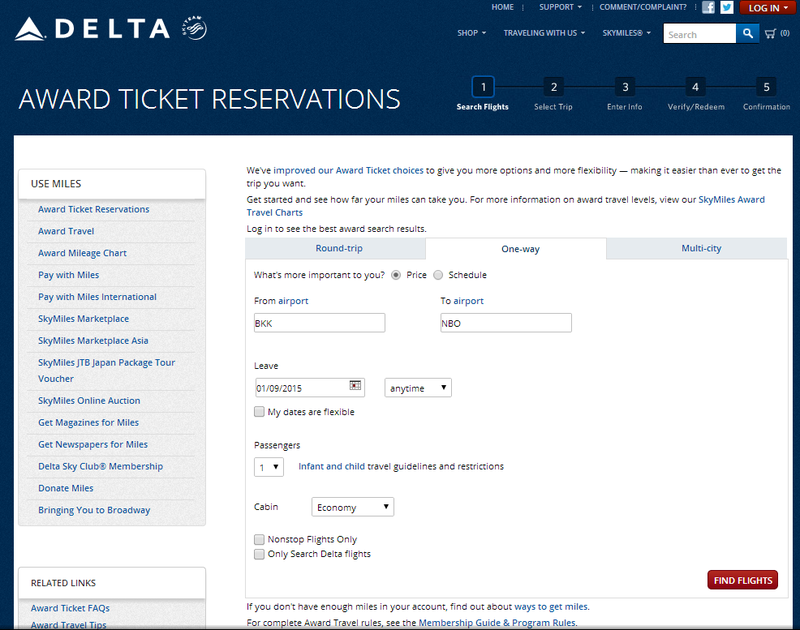 While Delta’s own website is the best way to find award space on Delta flights, it can be very tedious as the system is completely flawed, as shown below. For all SkyTeam awards, save yourself the nightmare and use the Air France website for reasons discussed later in this post. As if the high award redemption rates weren’t enough, Delta doesn’t let you book first class awards on any partner airline! To make matters worse, they have one of the worst booking search engines in the history of this game. For all non-SkyTeam awards, you HAVE to rely on the Delta website and/or ExpertFlyer before calling the Delta call center. Here is a sample search for the LAX to SYD leg in the aforementioned itinerary to Oceania. If you select ‘My dates are flexible’ right before clicking ‘Find Flights,’ it brings up the award calendar. 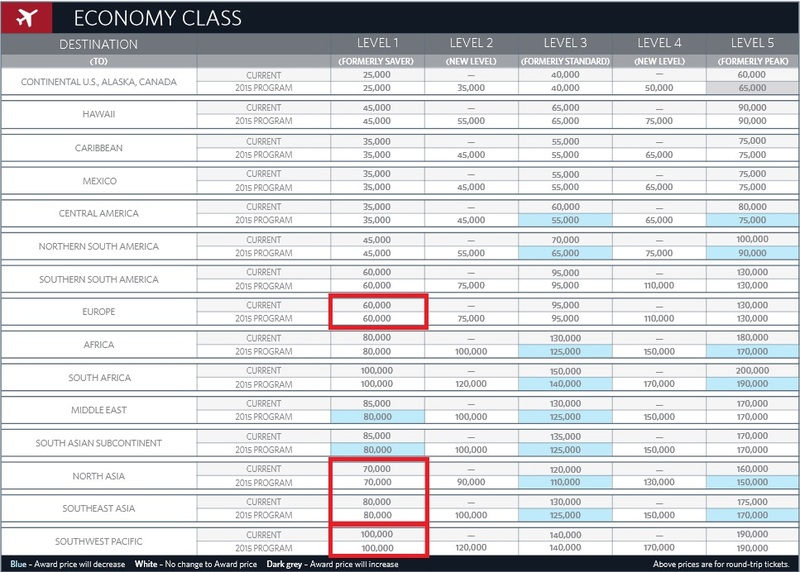 If the calendar showed peak awards how is it finding flights for saver level awards in business class to Sydney, Australia?!!? ….. That is the Delta search engine that has been bestowed upon us and there are no signs that this will be improved any time soon. In order to finish the rest of the itinerary, you would need to do the same thing for each leg of the trip and note down all the information. Air France and KLM have a combined frequent flyer program called Flying Blue. Currently the only way to easily earn miles is through transfers of American Express Rewards Points at a 1:1 ratio. This is not to say you can’t find value in other airlines, but it should be noted that premium awards redemption rates are outrageously high as shown earlier. The select airlines above serve short distances to different regions and Flying Blue’s routing rules allow one stopover and one open-jaw per roundtrip. This gives Flying Blue a slight advantage over others in flying to a wide array of additional destinations, that may not be served by a SkyTeam alliance member, easily on one single award. One frustrating aspect however is that neither Air France nor KLM show an award chart, you have to rely on their miles calculator! 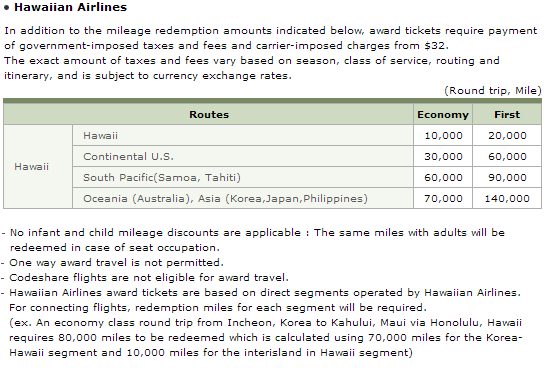 One award of interest is the USA to French Polynesia award which is only 60k miles for round-trip in economy on a direct flight that leaves Los Angeles 3x a week however that award in business class will cost you 150k miles. Flying Blue does try to save face with their frequent 50% off award tickets promotions, but even these have been limited lately to only a few cities in America. 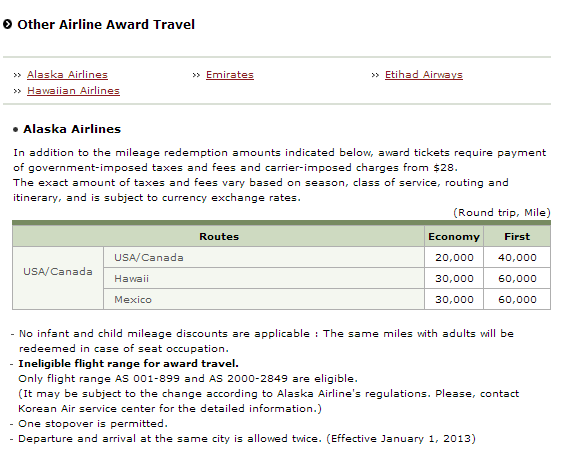 They do however charge fuel surcharges on all awards as long as the airline that you are redeeming for charges them. 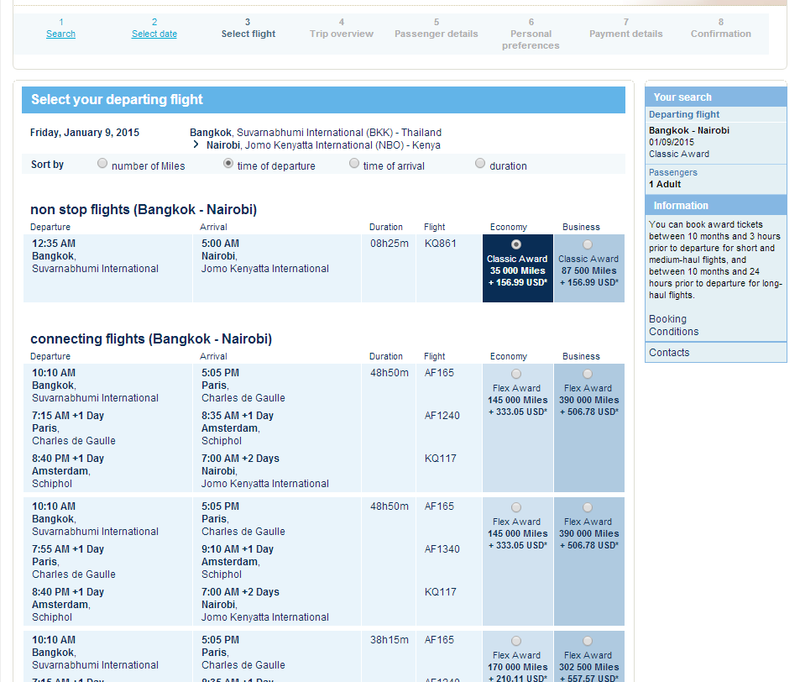 Flying Blue’s search engine, on the other hand, is one of the best ways to search for SkyTeam awards. You do not need any miles in your account to access their search engine and it is the most accurate when searching for award space. I recently booked a trip to Bangkok, Thailand and for analysis sake, if we wanted to extend the trip to Nairobi, Kenya from Thailand before returning home we would need to find a SkyTeam partner that flies there (preferably non-stop.) After using the ITA Matrix Software and/or Kayak I found that Kenya Airways would be one of the better options to fly with. From here we can either search Delta’s or Air France’s website for this award. We’ll take a look at both to show the significant differences in the available award space they show. 1. Go to Delta’s search engine. 2. Fill out the information needed, from BKK (Bangkok) to NBO (Nairobi) on January 9th, 2015. As always I search segment by segment so I’ll worry about the return leg later. Hit ‘Find Flights’ and we get Delta’s search results. 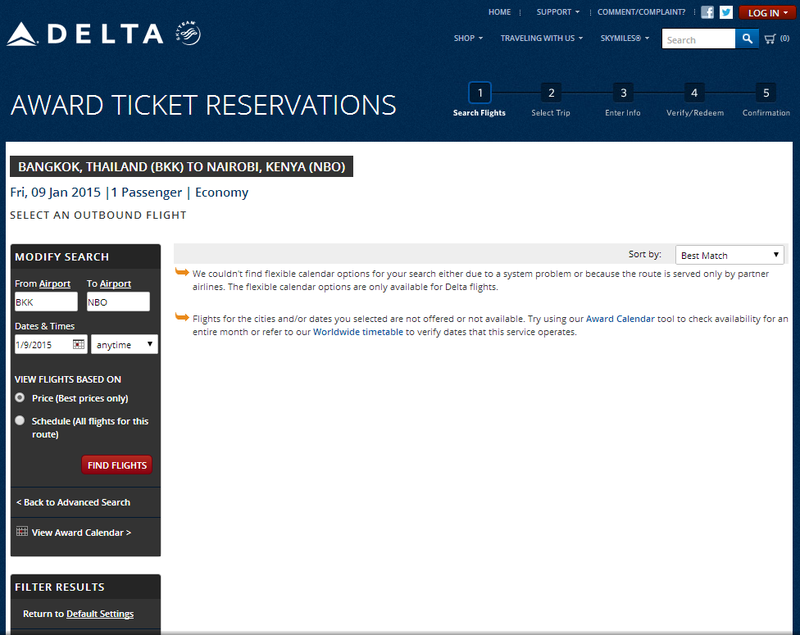 The results on Delta.com show there are no flights in the entire SkyTeam Alliance that service Nairobi. 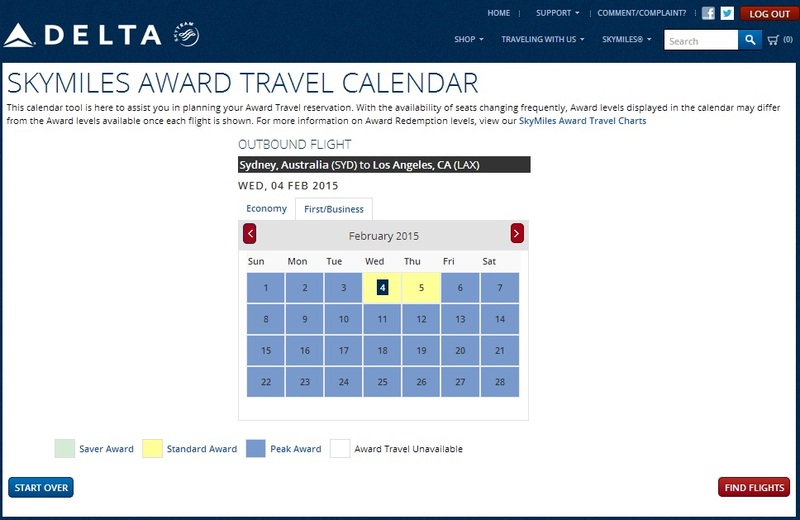 There will be times when the ‘View Award Calendar’ will take you to this same page (this is something that Delta has not fixed in years!) rather than the actual award calendar. However, something tells me we may have better luck using the Air France website, so let’s see what we can find there. 1. To search for awards go to the Air France search engine and enter the flight details as needed. 2. After clicking ‘search’ the results will automatically display an award calendar. 3. From these results it looks like Delta’s search engine was not giving us all award availability. This indicates that there there is actually great availability for the entire month of January 2015. 4. The desired flight (Kenya Airways non-stop flight) is available in the lowest price award level! The above example proves how strong the Air France search engine is in acquiring SkyTeam award availability data, all without jumping through too many hoops. In many cases it should be your first tool to find SkyTeam award space. Despite not having an exceptionally valuable award chart, Air France tries to gain ground through its promos, and numerous partners. This shows how useful airline alliances can be because even if you want to use Delta miles, it almost always pays off to search on the Air France website first for all SkyTeam awards. Korean Air miles are fairly easy to earn since they are a transfer partner with any ‘premium’ Ultimate Rewards earning Chase credit card. Not only do these cards offer valuable bonus offers, but also bonus spending categories such as the Chase Ink Plus’s 5X points at office supply stores. For a long time Korean Airlines did not follow most airlines’ trends of devaluations, however they had a major one in early 2014. The devaluation was still less devastating in comparison to what their SkyTeam partner Delta has recently done. Korean Air has a unique award chart for non SkyTeam partners where only certain routes on these airlines are allowed for redemption. While the two Middle Eastern airlines, Emirates and Etihad, are primarily only redeemable for intra-Middle Eastern routes and Asia-Middle East routes, Alaska and Hawaiian can be used for some high demand routes likely to be utilized by US residents. 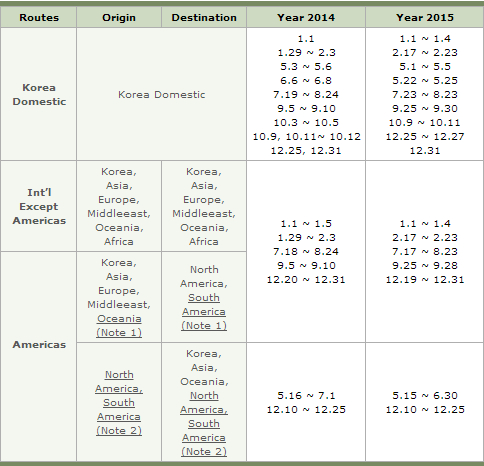 Korean Air’s routing rules allow for two stopovers and one open-jaw per round-trip and one stopover for one-way awards. 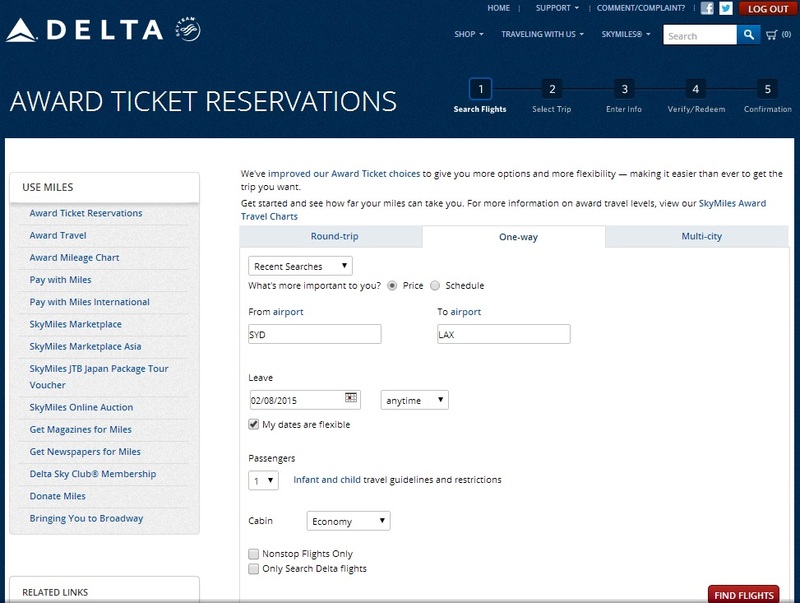 You’re also allowed one-way award redemptions for half of the round-trip required mileage. While there are a lot of redemptions that are worthy of notice, Korean Air, does have a few drawbacks, mainly the fact that they have blackout dates therefore it’s important to understand these before even looking at the rest of the award charts. 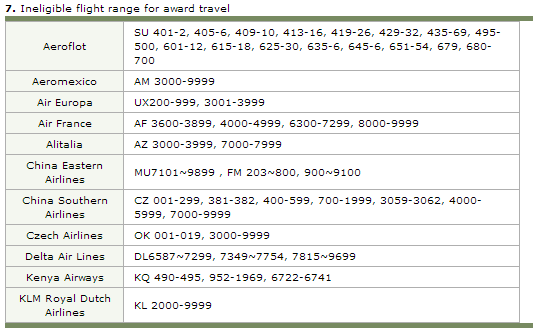 The following shows what dates are unavailable for award travel until 2015. The fact that they would black out the holiday season can be frustrating considering that a majority of travelers try to leverage vacation schedules around holidays to maximize the number of days spent traveling. Korean Air has different blackout dates for award travel on their SkyTeam partners, but these restrictions are much better than their own flights. 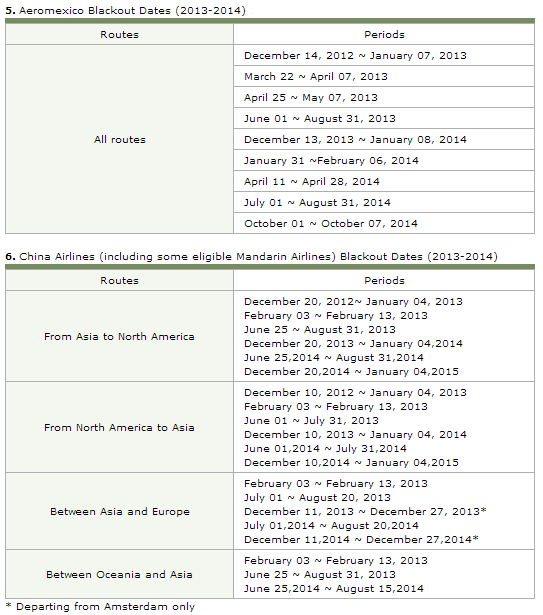 SkyTeam blackout dates only apply to China Airlines and Aeromexico and differ from route-to-route for Air China. Not to say this is not still a drawback, but it is more generous than the restrictions on Korean Air flights. Aeromexico and China Airline’s blackout dates may be a deal breaker for those who plan to fly with them. Majority of the flights listed here are domestic flights within the country to whom the airlines belong to. For example, China Eastern flights 7101 to 9899 are ineligible for award travel. A simple google search shows that MU9844 is a flight from Beijing to Shanghai and because this falls within the range listed above, this flight cannot be booked using miles. FM refers to Shanghai Airways which is a subsidiary of China Eastern that also isn’t redeemable using Korean Air miles. Korean Air only lets you search for award seats if you have enough miles for the award you are trying to book, therefore the best way to search for any SkyTeam member award space is to use Air France’s search engine and Expert Flyer for strictly Korean Air award availability. Now that we’re done with all the restrictions, let’s take a look at how their awards are priced out. 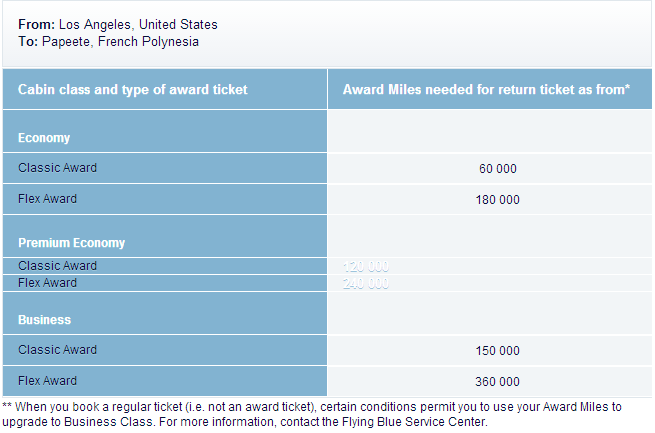 Probably the greatest bargain in terms of mileage redemption for a very highly sought after award noted under ‘Note 1’: USA to Tahiti by Air France for only 90k roundtrip in Business class! However keep in mind that Korean Air, like Air France, passes on any fuel surcharges to the passengers. 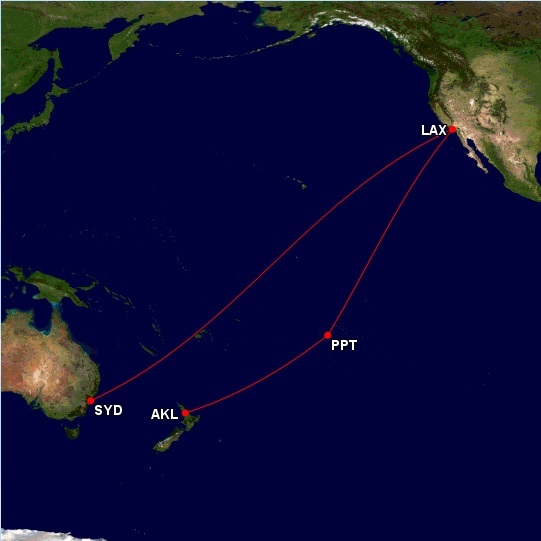 The itinerary shown in the Delta section of LAX – PPT – AKL & SYD-LAX would not be possible here in the same manner because Korean Air does not partner with Virgin Australia nor Air Tahiti Nui. Because 90k miles for First Class round trip is such a steal I would not mind if I was not able to get a stopover to visit a third place. The best place to find award space on Korean Airlines is using either the Air France website and / or Expert Flyer. While the three airlines that were analyzed today brought a little something different to the table, there are some distinctive takeaways regarding finding SkyTeam award availability. 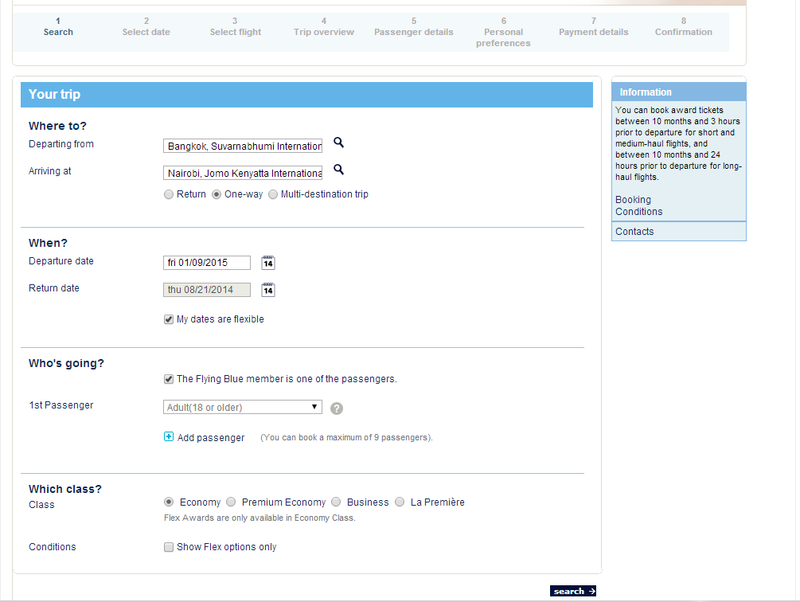 Air France’s search engine is the best option for finding SkyTeam award space and likely the only way to go. 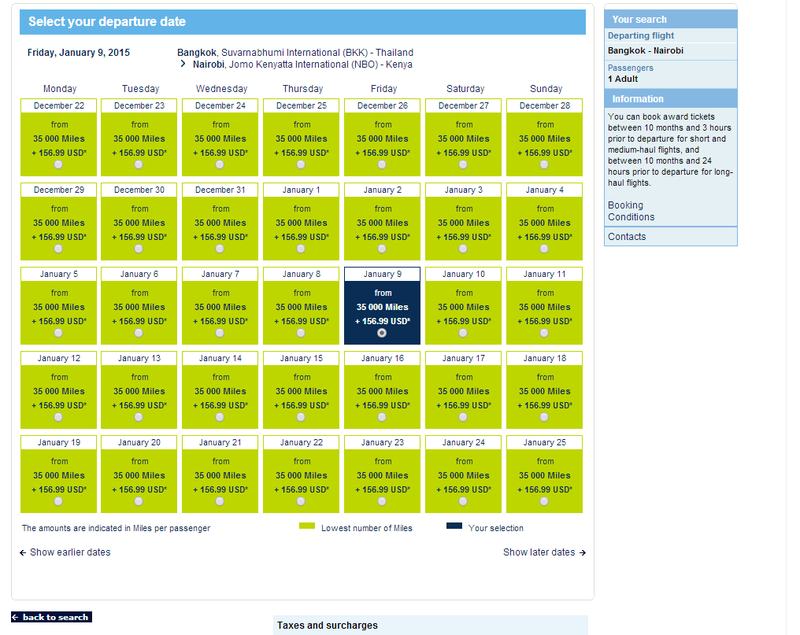 Expert Flyer shows availability for some airlines but not all. 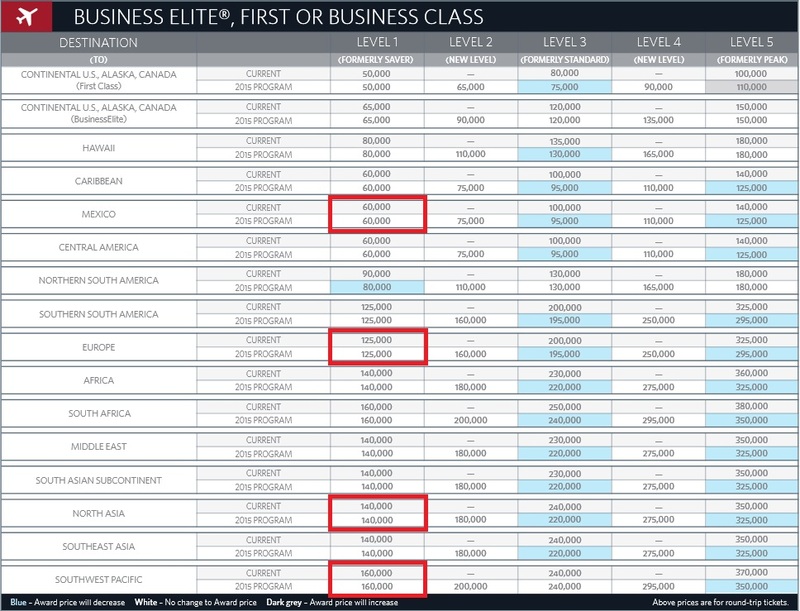 When deciding which airline miles to earn and burn within the SkyTeam alliance you first have to decide what is more important: 1) to see more places on the same award or 2) to get the best deal for the number of miles spent. In the French Polynesia trip example, the Delta redemption allowed an additional trip from Tahiti to Australia / New Zealand which would not be possible with Korean Air, but the total trip cost would be 40k miles less.